Many breeds are mistaken for pit bulls. Without registration papers or DNA testing, it may be impossible to confirm the type of pit bull you have. Though you can take an educated guess, it's hard for the layman to be certain of his breed. The fact is, "pit bull" is a common term referring to several breeds. Check the registration papers that you received when you purchased your pit bull. Responsible breeders will register their puppies, even mixed-breed litters. The registration papers will indicate your dog’s breed. Ask the breeder what type of pit bull he breeds. Pit bulls are often mistaken for other types of dogs. Your breeder should allow you to meet the parent dogs and identify the breed and bloodline of your pit bull. Complete a DNA test on your dog. You may be able to obtain a DNA test kit from your veterinarian. If not, order from one of the many companies that offers testing, such as Mars Veterinary's Wisdom Panel arm. You will need to take a swab of your dog’s DNA and send the results to a lab for testing. Test results will show what breeds make up your dog’s chemistry. Conduct a visual assessment of your pit bull to make an educated guess of his type. American pit bull terriers are typically between 35 and 65 pounds; they have short, smooth coats. American Staffordshire terriers are larger, at 65 to 90 pounds, with thick, short coats. Staffordshire bull terriers are smaller, typically weighing 29 to 38 pounds; they have smooth, short coats and broad heads. Compare your dog’s physical and personality characteristics to those of other breeds commonly mistaken for pit bulls including American Staffordshire terriers, American bulldogs, boxers, mastiffs, Cane Corsi and Rhodesian Ridgebacks. You can find breed information through research in books and by consulting vets or breeders. If your dog is from a rescue, he may be a mixed breed that resembles a pit bull but is not. Mixed-breed dogs of all types are often mistaken as pit bulls. 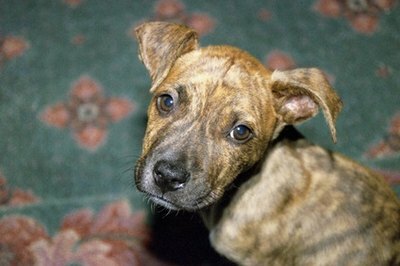 Consider rescuing a pit bull; pit bulls and pit mixes are prevalent in shelters.